We humans tend to want to do things our own way, following our agenda. We tend to want what is comfortable and convenient for us. We tend to fear the unknown. We tend to react poorly when we feel threatened by change. We tend to get offended when other people resist changes we are trying to make. We need God’s power to rise above our natural tendencies so we both act and react with the Christ-like thinking, attitudes, and actions needed to navigate change well. Just as we should not rely on our own understanding when making decisions on the kind of change needed (Prov. 3:5-6), neither should we rely on our own power to affect the change and to navigate change well. God’s power provides the perspective we need during the change process. Think about it. God has power to create the world (Jer. 10:12), part the sea (Ps. 74:13), shut the lions’ mouths (Dan. 6:27), raise Jesus from the dead (1 Cor. 6:14), and so much more. Can’t He help us navigate change well? Isn’t His power greater than anything we might face? God’s power provides the perseverance we need make it through the change. Think about it. God has proved Himself faithful over and over through the pages of Scripture in providing His power to those who needed it. You have undoubtedly experienced His power at work in your own life in the past. Won’t He help us in our present circumstances if we turn to Him? 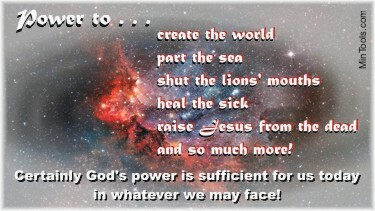 Isn’t His power great enough to get us through the long haul and deal with any obstacles? We need to remember God’s power in order to navigate change well. The Israelites were burdened down by the Egyptians. God provided a way for change, for them to leave Egypt. It got hard along the way and they wanted to go back to the way it was. They rebelled against God, His commands, His leading. The reminder they needed? — God’s power. Let’s learn from the Israelite’s negative example and grab hold of God’s power so we navigate change well as His Church. This entry was posted in Change Management.